Even if your lover’s gruesome, you could be an awesome twosome! Roman mythology and 1930’s Alabama collide in this zany musical romp. This comedy employs audience participation (à la Spelling Bee) to tell the true story of a meek dime store clerk who challenges the city’s debutantes in an elite beauty pageant. 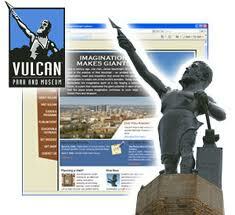 The city of Birmingham takes pride in its statue of the ugly, bare-assed god Vulcan. A stranger (the god Vulcan in disguise) announces a beauty contest to crown Vulcan’s Queen. Evelyn, a bookish clerk at the five-and-dime, would love to win the contest for the scholarship, but she has neither the money nor the self-confidence to enter. Three conniving debutantes prepare for the contest, with the assistance of hapless audience members. Plump Pearl enlists her mama’s aid to make cabbage soup. Ruby, a cheerleader who helps each member of the Crimson Tide score, seeks flirting tips from her mama. Self-righteous Opal blackmails her philandering daddy into buying her the most pricey gown in town. J.C., the store manager, buys Evelyn a gown and pays her entrance fee. Evelyn’s admirer Glenn, a nerdy, aspiring inventor, promises to help her prepare for the contest. The debutantes try to convince her that someone from her low class shouldn’t dare to compete. Outraged, Evelyn vows to win the crown. But she has fierce competition from the debs and the alluring, unpredictable audience volunteers!